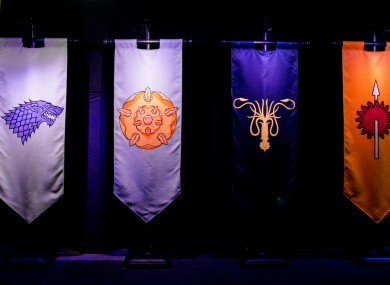 Banners carrying the sigils of House Bolton, House Stark, House Tyrell, House Greyjoy, House Martell, and House Arryn, on display at the launch of the Game of Thrones touring exhibition at the Titanic Exhibition Centre in Belfast. #COMEBACK: Tiger Woods has won the 2019 Masters at Augusta, completing one of the greatest comebacks in the history of golf. #SUDAN Its new military leaders want the rest of the world to back them. #BREXIT Tony Blair and Bertie Ahern have penned an op-ed calling for a second Brexit referendum. #USA Top Democrats defended Ilhan Omar after President Donald Trump retweeted video that was edited to suggest she was being dismissive of the significance of the 9/11 attacks. #JULIAN ASSANGE His father said he could be deported to Australia.